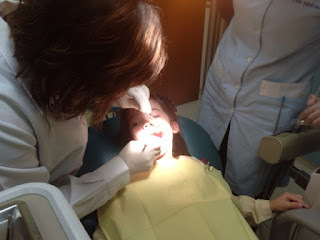 Girl's 6-monthly dental check-up appointment was today after school. She enjoyed the detour very much! The appointment was prompt at 4pm, so we did not have to wait that long. Her dentist, Dr. Estee Tan, was a little surprised at the speckled new molar on her bottom left. Calcium deficiency is the probable cause and the return of nightly milk before sleep is here to stay until her calcium deficiency is addressed. Girl was also prescribed a dental mousse derived from milk to improve the situation. Girl chose vanilla flavour. It is fluoride free so it will be quite safe if she does not spit every single bit out after nightly rub on the surface of her newly cut bottom left molar. The bottom right molar cut is complete now and the fissure is quite deep. It will need a fissure-sealant treatment once the bottom left molar is totally cut so it can be done simultaneously. Next 6 monthly check-up appointment may be suitable time, if not sooner. No other baby teeth are shaky at this point so we can relax for a while longer. Since I am not a big fan of milk source calcium for her (have to watch her eczema from cow milk protein intolerance), brocolli and other calcium-rich vegetables, nuts and seeds source of calcium will be featured more regularly in our dinner rotation menu. For her courage at the dentist, she was rewarded with 2 princess stickers by her lovely dentist. Thank you, Dr. Estee Tan! I hope you were able to address the calcium deficiency shortly after her dentist appointment, but I am glad her other baby teeth were okay. I think adding vegetables and nuts to her diet is a great idea. It looks like she was a trooper during her dentist appointment. She definitely earned her stickers for being such a brave little girl.